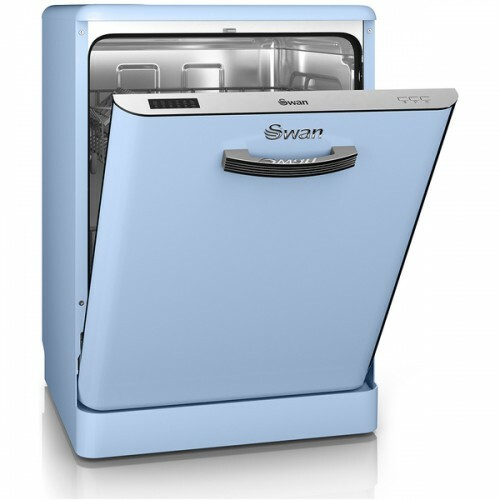 Swan retro dishwasher offers style and colour to your kitchen. This blue Swan dishwasher looks really cool, and will bring a touch of retro style to your kitchen. It holds 12 place settings, which is enough for a bigger family and comes with an A+ rating for energy efficiency. This means it'll be nice and cheap to run, and it only uses 12 litres of water per cycle too. There are 6 programmes to choose from, including a quick wash for when you're in a hurry. Add to this a delay start button, which lets you set it to run at a time to suit you, and you've got a great little appliance. Graded product, new, with no obvious marks to the front, fully guaranteed by us with a 6 months return to base warranty. PLEASE NOTE:TO CHECK AVAILABILITY: CALL between 9.30-5.15 p.m. Mon-Fri and Sat 9.30-4.00 p.m. Closed Sunday.